It’s almost time for the 2014 MLB All Star Game but before tomorrow night’s Midsummer Classic, balls we be getting blasted in tonight’s 2014 Homerun Derby! AL captain Jose Bautista looks to help his squad retain supremacy with his roster including 2013 Homerun Derby Champion Yoenis Cespedes, Adam Jones, Brian Dozier, and Josh Donaldson. NL captain Troy Tulowitzki has his own plans with a roster including betting favorite and current 2014 Homerun leader Giancarlo Stanton (+275), Todd Frazier, Justin Morneau, and debuting Yasiel Puig. 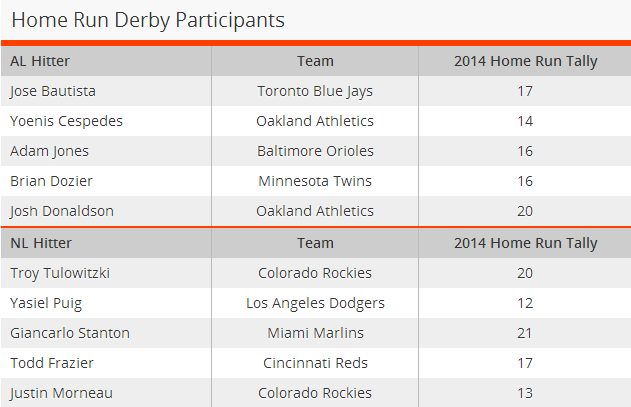 For a complete list of current betting odds for the 2014 MLB Homerun Derby, check out https://www.bitcoinrush.io/bet-sports-homerun-derby! «Experience the Difference @ BitcoinRush.io Sportsbook! »BitcoinRush.io NFL Survivor Pools! Free Pool worth 2 Bitcoin!